If you enjoy a cold glass of iced tea as much as we do, you care about the taste. And we care, that you care! From where we source our tea, to the special way we make the new NESTEA-we've changed a lot, and the change is refreshing. It all started in Nilgiri, India-a region known for quality tea and a history we're delighted to be a part of. With the taste of Nilgiri tea leaves in every sip, and an exciting new recipe with fewer ingredients than ever before, each flavor is simply delicious! Our new Classic varieties offer fruit-flavored favorites, and we've added Real Brewed and Organic selections to our lineup for an authentic tea taste. This Lemon Flavored Iced Tea perfectly pairs iced tea and lemon for a delicious, citrus sensation. Case of 24, 16.9-Ounce plastic bottles (4 packs of 6 per case); keep ample refreshment on hand for any occasion. Bright, flavorful, lemon-flavored iced tea that is refreshingly thirst quenching. Made with fewer ingredients and tea leaves from Nilgiri, India-where tea is tradition! 56 calories, 0g total fat and 12g sugars per 8-Ounce serving. No high fructose corn syrup, and no artificial colors or flavors. 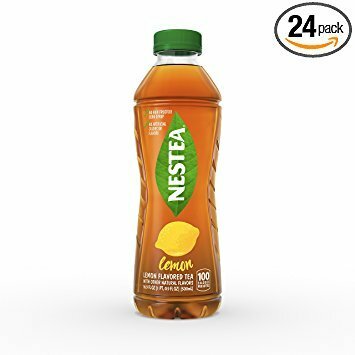 If you have any questions about this product by Nestea Iced Tea N, contact us by completing and submitting the form below. If you are looking for a specif part number, please include it with your message.